How did Diderot’s Encyclopédie “tree of knowledge” impact the making and the meaning of knowledge in the Enlightenment? The exhibit celebrated the tricentenary of Diderot's birth. Homme de lettres extraordinaire, Diderot (1713-1784) was featured in the January 24, 2013 New York Times article, Diderot, An American Exemplar? Bien sûr, to remind us that "thumbing one's nose at the establishment has been central to our own cultural and political traditions since, well, [his] time. After all, that's how we became Americans in the first place." Diderot co-edited with d'Alembert on the most daring publishing venture of the Enlightenment: the Encyclopédie, with a view to revolutionize the way people commonly thought. At the center of the exhibit, the Encyclopédie’s schematic tree of knowledge, inspired by Bacon’s own, displays the interdisciplinary and collaborative nature of knowledge making in the 18th-century. Branching out into Memory, Reason, and Imagination, human understanding, orentendement is featured as the subversive key to accessing, critiquing, and creating knowledge through the disciplines emerging from these faculties – including philosophy, history, and the literary and creative arts. Arising from a cross-referencing dynamics, knowledge also comes out as a creative process bearing on the sciences as well as on the humanities. 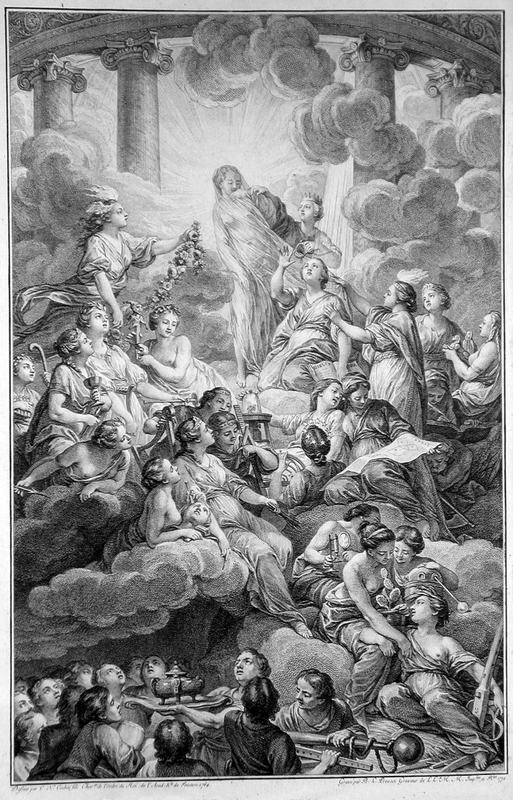 The above image: Encyclopedie’s frontispiece, full version. Engraving by Benoît Louis Prévost. Isabelle received her Licence d’anglais from the Université de Paris III-Sorbonne Nouvelle in 1990, and her Maîtrise de littérature anglaise from the Université Blaise Pascal de Clermont-Ferrand in 1992. She graduated from Michigan State University, where she received both her MA (1993) and her Ph.D. (1999) in French Literature. She has published on Diderot, Olympe de Gouges, and Sébastien-Roch-Nicolas Chamfort. Her current research deals with the letter form in polemical and philosophical letters to highlight the key role they played in carrying out the Enlightenment project of reforming the way people thought.